What’s America’s favorite family vehicle? The SUV? The minivan? These days, it could very well be the pickup truck. These car-based crossovers fulfill the people-moving role of SUVs quite handily, but they’re not as capable in terms of raw utility as their truck-based forebears. This shift in SUV preference has increased the appeal of having a pickup truck sit alongside that crossover in the driveway of many active households. None of this would matter if pickups didn’t also meet the must-have criteria of a well-equipped family car. The latest crop of pickups scores well here. They have comfortable seats and overall spaciousness, especially in the backseat, that puts many cars to shame on an extended road trip. Newer crew cabs are roomier than ever: Manufacturers have been lengthening their cabs and improving the size of the rear door openings for easier entry and exit. From accommodating teenagers to infants in car seats, crew-cab truck cabins can be a good fit for a family. Pickups also offer up an abundance of convenience features and the latest infotainment technology. You don’t have to shop the highest end of the price range to find smart entry with push-button start, heated and ventilated leather bucket seats, dual-zone automatic climate control, and touchscreen navigation paired with premium audio sound and Apple CarPlay and Android Auto smartphone support. These safety upgrades are paying off in a big way. 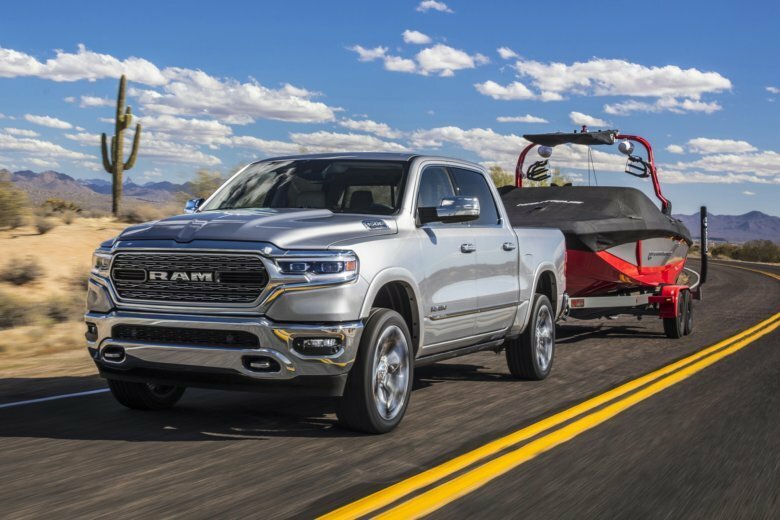 The newly redesigned 2019 Ram 1500 crew cab scored top marks in the Insurance Institute for Highway Safety’s crash and automatic emergency brake testing. The same goes for the 2018 Ford F-150 and Nissan Titan. The 2019 Chevrolet Silverado and GMC Sierra have not been tested as of publication time, but as all-new designs they should do well. Edmunds’ 10-year trend data says families are willing to spend big for a kitted-out truck. The average transaction price of a full-size truck has risen almost $16,000 to a current level of $48,431, even though base prices have risen barely $10,000 in the same period. There’s room to spend even more: The average starting price of the highest trim levels rose from $43,135 in 2008 to $65,670 in 2018. EDMUNDS SAYS: Yes, they’re big and their gas mileage is unspectacular. But modern full-size pickups are roomy, well-equipped and capable. That makes them well-suited to families with active outdoor lifestyles.